What brand of clay did you use? What colors did you use? If you mixed them yourself you can include a color recipe here if you like. I hand painted white clay with a mixture of blue and green acrylics, as per your tutorial. I used Sculpey transparent on top. I added little gold jewellery beads to fill large gaps and used regular water based varnish to finish. Tell us how it went. Was it fun? Easy? Hard? Did you struggle with anything? Do you have any tips for others trying this technique? I also used the paper sandwich technique for running the transparent clay through the pasta machine and this was critical. I used liquid clay as a ‘grout’ as I was a beginner and didn’t know any better. 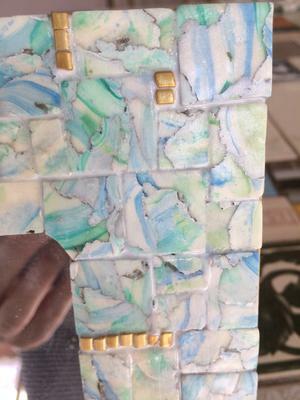 I now know that I can use a contrasting clay as the grout (as per your tutorial). I’m a little unsure how a wooden picture frame would cope in the oven when baking though. Join in and add your own project! It's easy to do. How? Simply click here and fill in the project submission form.